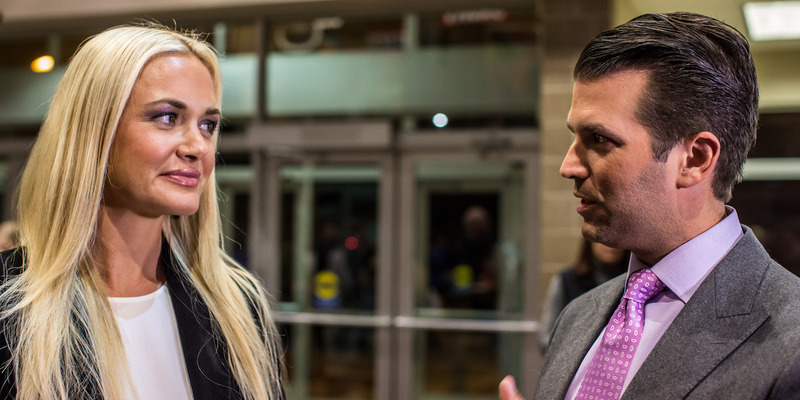 Brendan Hoffman/Getty ImagesVanessa Trump and Donald Trump Jr.
Vanessa Trump has filed for divorce from Donald Trump Jr., President Donald Trump’s eldest son. The divorce is not contested, meaning the president’s daughter-in-law does not expect a fight over custody of the couple’s five children or assets. Sources told The New York Post that Donald Jr.’s political involvement and aggressive social-media presence played a part in the split. Vanessa Haydon Trump filed for divorce from Donald Trump Jr., President Donald Trump’s eldest son, in a Manhattan court on Thursday afternoon. The divorce is not contested, meaning the president’s daughter-in-law, a former model and actress, does not expect a fight over the couple’s assets or custody of their five children. Friends told the New York Post that the pair, who married in 2005, have been living largely separate lives. According to the Post’s sources, Donald Jr.’s political involvement, social media presence, and frequent travel played a role in the split. “The problems have been there for a long time, the couple had hoped to stay together during the president’s time in office, but it is getting harder to resolve their issues. He’s never there,” one source told The Post. Unlike other Trump family members, Vanessa, 40, has maintained a low profile over the past few years, largely staying out of politics. Meanwhile, Donald Jr., 40, has been a vocal supporter of his father, campaigning alongside him during the 2016 election and fiercely defending him in the media. The divorce comes just a month after Vanessa and her mother were hospitalized after opening an envelope addressed to Donald Jr. that contained a white powder, which was later determined to be cornstarch, along with a threatening note. After assuming leadership of the Trump Organisation with Eric following the election, Donald Jr. has remained an outspoken unofficial spokesman for the Trump administration, repeatedly attracting criticism for factually inaccurate and offensive social-media posts. Most recently, Donald Jr. liked a tweet linking antidepressants to mass murder, and another pair of tweets questioning the motives of a teen survivor of the Marjory Stoneman Douglas High School mass shooting in Parkland, Florida. The couple met in 2003 at a fashion show. “Donald Trump comes up to me with his son: ‘Hi, I’m Donald Trump. I wanted to introduce you to my son Donald Trump Jr.,'” Vanessa told The New York Times in 2006. The conversation was awkward – and things only got more uncomfortable. During the intermission of the show, Trump spotted Vanessa again. And he once again introduced the model to his son. Six weeks later, the two met again at a mutual friend’s party. They didn’t recognise each other at first. “Then suddenly, something clicked: Wait, you were at that fashion show. Wait, you’re ‘the one with the retarded dad!’ Vanessa blurted out,” The Times reported.